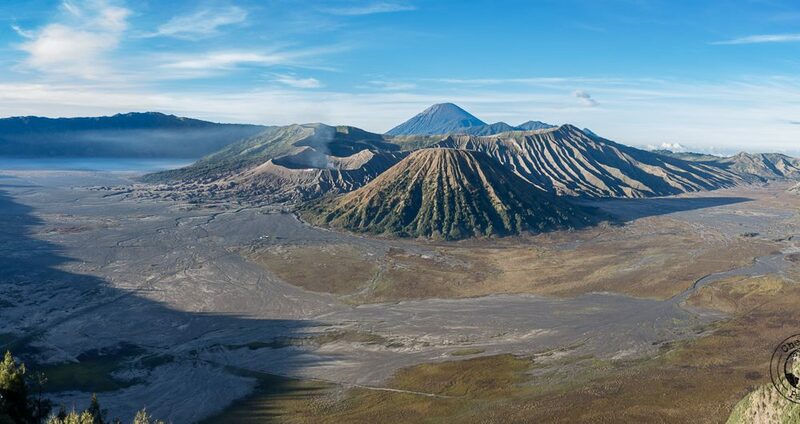 The hiking trips to view both the Mount Bromo sunrise and Kawah Ijen blue flames in eastern Java are amongst the island’s most sought-after experiences given the relative ease of accessing the volcanos and the fantastic views from both the craters and the viewpoints around Bromo. 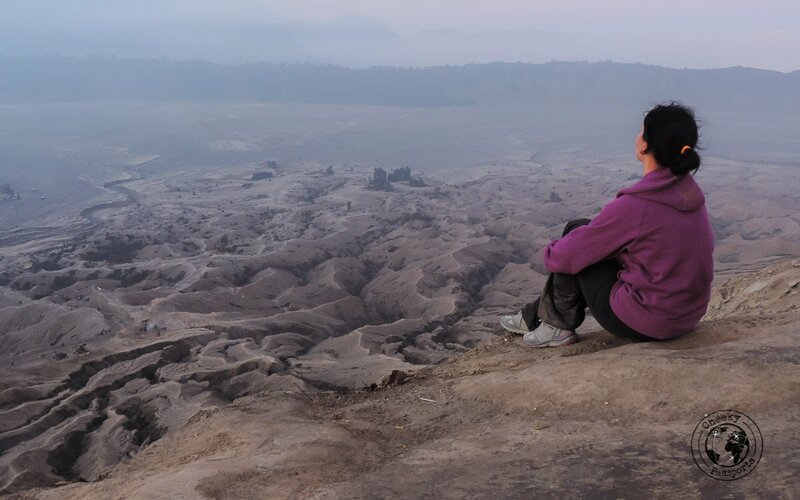 Peering into the crater of the active Mount Bromo, which is part of the Bromo Tengger Semeru National Park, is surely an exhilarating experience, but the more beautiful views and postcard picture shots of the Mount Bromo sunrise can be seen from the viewpoints around the caldera. Related: Headed to Karimunjawa next? Read all about traveling to Karimunjawa! If you have time, we really suggest that you go about seeing the Mount Bromo sunrise and Kawah Ijen blue flames at a leisurely pace. 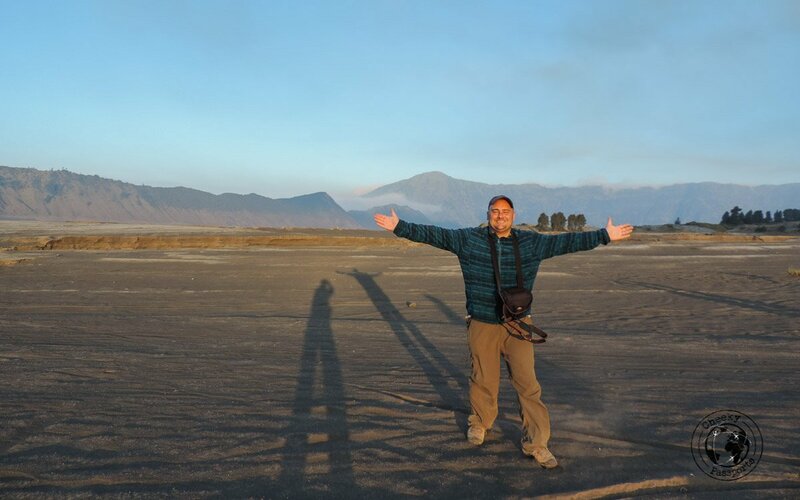 But, if like us, you are short on time and you would like to summit both craters as well as hike up to the view point to watch Mount Bromo and its fascinating surroundings bathed in early morning light in as short a period as possible, here’s your guide to doing this in two days, without a tour. If you ‘re coming from central Java, i.e. 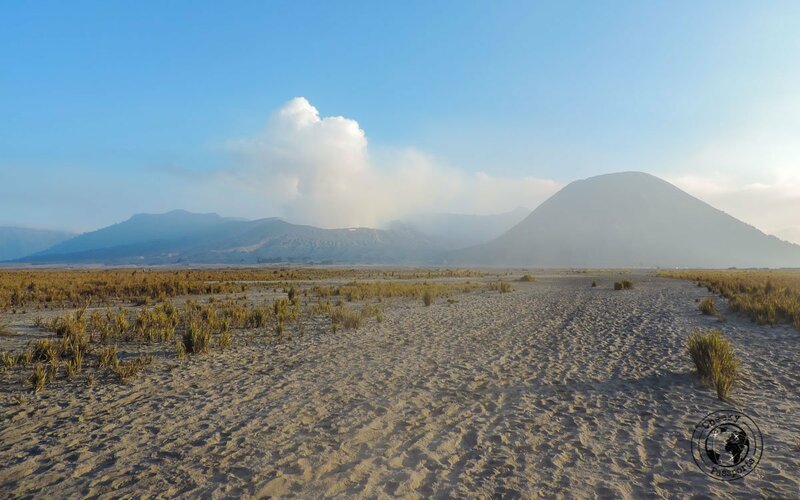 to the west or north of Mount Bromo, you will most likely choose to view the Mount Bromo sunrise first, and later move on to seeing the Kawah Ijen blue flames. Assuming that you will start off your journey from Malang or Surabaya, the first place you need to get to is Probolinggo. 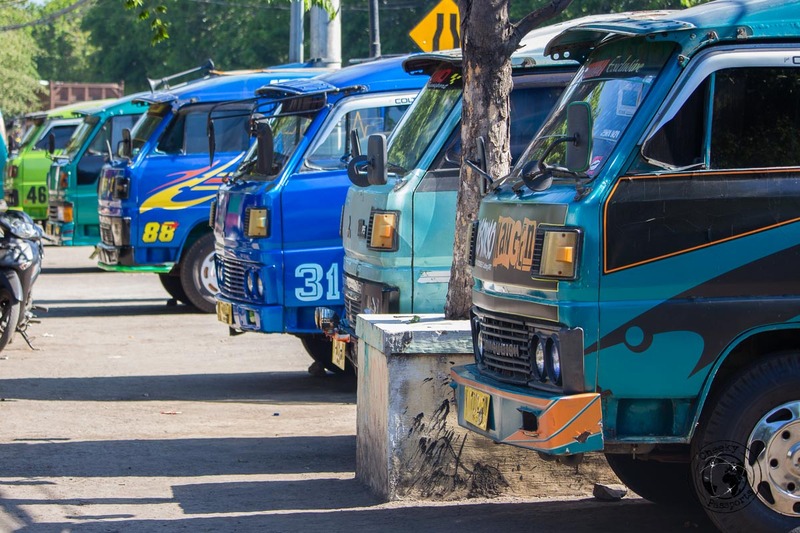 Public buses run from Surabaya (Purabaya Bus Terminus) to Probolinggo with a journey time of about 3 hours and a cost ranging from 16,000 IDR to 30,000 IDR (about €1.00 to €1.85) depending on which type of bus you take. There are two types of services, the standard and the Patas (supposedly first class and express). Patas looked marginally better, and considering that the price difference was of less than €1 we thought it was worth taking. They leave from different bays, so double check which bay you want to go to if you are very specific about which type of bus service you wish to use. Be sure to ignore the touts at the station trying to direct you to different buses, and pay only the driver once you are on the bus, and you notice that the locals paying too. The platforms and buses themselves are very clearly marked and you can easily find the bus by yourself. Just walk straight on until you reach an airport-like viewing gallery, from which you can observe all parked buses underneath, with all directions clearly marked at each bay. After almost three hours, when you are already at Probolinggo, IGNORE the conductor (no matter how kind he may have seemed throughout the journey) who tells you to get off the bus at the place marked as “bus terminal”. This is nothing but a decoy agency who will try to sell you a more expensive ticket with commission. The actual bus terminal is about a kilometre down the road from this office. You will notice it as it is a large area with many parked buses and platforms, unlike the previous decoy which is an office in the middle of the main road! You can use a GPS to ensure that you alight at the right spot. The Probollingo bus terminus name is Bayuangga (not to be confused with Banyuwangi which is the village close to Ijen), and here’s a google pin just to facilitate your travel! When you descend the bus, again ignore all those trying to pull you away and lead you towards other buses or those wanting to carry you bag. Exit the bus station as soon as possible, by following the same path the bus came in from, heading left of the main road (Jl. Raya Bromo), towards the mini-vans for Cemoro Lawang (more on that later). A train service is also available from Surabaya to Pobolinggo, but this will drop you at the station which is 4 km from the terminus. You can expect to pay around 5-10,000 IDR (about €0.30 – 0.60) each for an angkot to get you to Bayuangga. Again, be careful with scams! Buses from Malang also run to Probolinggo. We have no experience in making this journey ourselves, but we imagine that the experience would be very similar to the one from Surabaya. If by some unfortunate luck, you’re stuck in Probolinggo for the night, a trusted friend and reader highly recommends staying at Clover Homestay and Cafe. A very clean and welcoming double room with private bathroom costs around IDR 200,000 (about € 12), and the owner who speaks English, provides extremely helpful and valuable information regarding the surrounding areas including Mount Bromo. Within Probolinggo’s den of scammers, a kind and helpful individual is always appreciated! Unless you get sucked up in a private transportation scam, the cheapest way of getting to Cemoro Lawang to view the Mount Bromo sunrise from Probolinggo is via a full angkot (also called bemos or bisons). The cost is around 535,000 IDR (about €33.22) per vehicle, which can be shared among 15 people resulting in a cost of about 35,000 IDR (about €2.20) per person. The vehicle will only leave when the driver recovers the cost, i.e. either when it is full or if a smaller number of people are willing to the divide the total price amongst themselves. 15 people in one angkot is the equivalent of travelling in a sardine can….you get the idea! The angkots are known to be a lot less frequent after 3pm. Since we arrived at around that time, we got a bit worried seeing only another couple in the ‘queue’. But as we waited only five other people cropped up after about 20 minutes. We all collectively decided to leave and hence shared the vehicle cost between 9 people, resulting in a cost of about 60,000 IDR (about €3.70) per person, and a slightly more spacious ride! The journey took about 2 hours, which gave us sufficient time to get acquainted with the fellow passengers, a group of people, with whom we eventually traveled all the way to Bali! It’s good to join forces sometimes! The angkots to Cemoro Lawang are usually waiting OUTSIDE the Probolinggo bus terminal. Just go out of the main gate and turn to the left. Hopefully you will be greeted by a bunch of people waiting for the angkot to fill up, so that you don’t have to wait too long until you can leave. 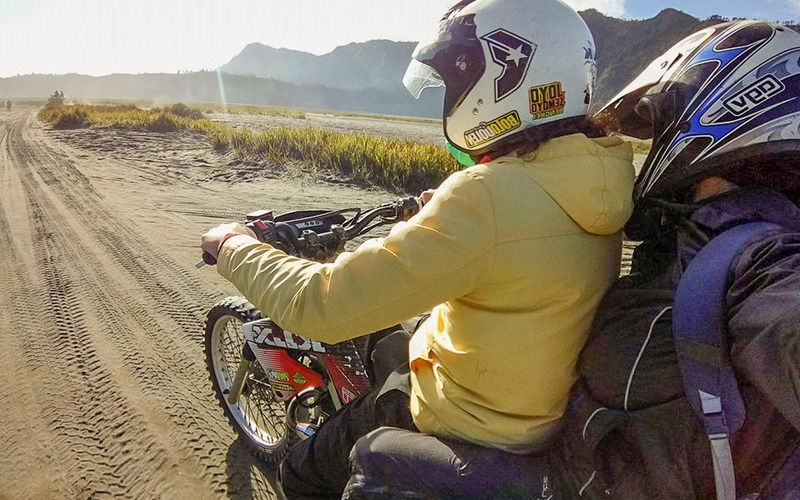 If you’re adventurous and have experience in off-road motorbiking, it is possible to hire a trail bike in Malang and ride all the way to the Mount Bromo crater. 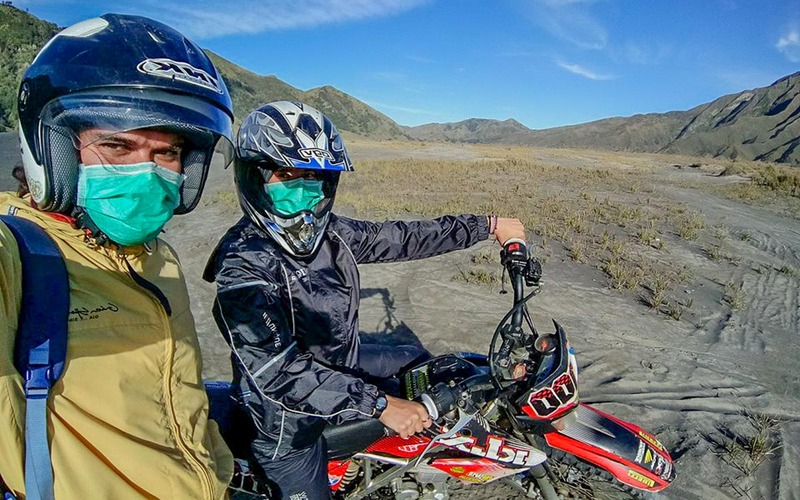 Our friends from DreamTrip of a Lifetime decided that this would be a more intriguing way of visiting the crater and experience the Mount Bromo sunrise as opposed to just booking a 4WD tour. “There were only two options from where we could hire trail bikes in Malang, Sawojajar Adventure and Kaldera Adventure. We visited the cheaper rental (210,000 IDR for 24hrs – about €13.15), and hired a Kawasaki KLX the night before. After having slept for a few hours, we drove off at 1:30am! Quite honestly, driving through towns, steep uphill paths and rugged downhill trails in the middle of the night was scarier than we anticipated, especially since we were on our own (for safety’s sake, traveling with other people is highly recommended!). We made our way to Nongkojajar, passed Wonokitri and drove past the ticket terminal which was unmanned at the time. No-one stopped us to pay the park fee, so we arrived at King Kong hill carpark at around 3:45am, together with many other 4WDs (most stopped at a different lookout, so with only a few other people around, we felt quite secluded). The first light shone at around 4:55am and as the sun started to rise, Mount Bromo came into view. We started to feel the crisp cold, but thankfully had brought jackets and warm clothing for the bike ride! Next up was the crater, and as we drove towards it, we off-roaded on rough and deep sand, which was essentially the reason why we hired a trail bike and not a scooter. After having paid a parking fee of IDR 2,000 (about €0.13) we walked up around 220 steps to the top. We strongly suggest taking a face mask due to the dust disrupted by the many horses which are also a transport option to get you half way through the trail. As we weren’t committed to a tour, we drove all the way around the crater, past Teletubbies Hill, enjoying many photo opportunities of the contrasting luscious greenery and dry sand, and finally back onto the sealed road. But back to our own experience using public transport. Upon arrival to the Cemoro Lawang village, the angkot driver stopped us at a checkpoint where 10,000 IDR (less than €1) entry fee to Cemoro Lawang was collected. After having put on some warm clothes, (it gets chilly up there), we realised that we were just in time to catch sunset at the crater. If you intend going to Banyuwangi (for the Kawah Ijen blue flames) the following day, it is best to summit the Mount Bromo crater on Day 1 (same day you arrive in Cemoro Lawang) and go to the view point very early morning on Day 2 for the Mount Bromo Sunrise. In so doing, you can manage to leave Cemoro Lawang early morning and reach Banyuwangi (for the Ijen blue flames) in the afternoon of Day 2. Jeep tours to the crater are available but it is really easy to go on foot. You just need to walk across the aptly-named “Sea of Sand” which takes 30 – 45 minutes. We have been informed that to get down to the Sea of Sand, (besides going through the main trail which runs from the centre of the village), there is also the local’s horse trail (found to the right of Cemara Indah Hotel in Cemoro Lawang) which is unguarded and thus the Bromo Tengger Semeru National Park fee – which stands at 220,000 IDR (about €13.70) on weekdays and 320,000 IDR (about €20) on weekends – is not collected at this entrance. The path is clearly marked on the Maps.me app. From then on you just walk in the direction of the volcano across the flat sea of sand (during which your clothes will become covered in a thick layer of sand and dust). After half an hour or so, you will need to start climbing the actual volcano along some paths, and later climb up some steep steps (over 200 in all) to get to the actual crater. It was just about to get dark when we set off on the hike so we literally ran across the plain, which was no mean feat considering our poor level of fitness at this point in our travels. The hike up was the cherry on the cake and as I gasped for air, I wondered whether the views from the top would be worth the agonising jog/climb. But oh they were! Having said that, can you see how red our faces are, a full 10 minutes after we had reached the summit? The first 30 minutes at the top were spent recovering from the jog! Be sure to take a flashlight with you since you will need to walk back in pitch darkness. The more popular activity in Cemoro Lawang is to view the Mount Bromo sunrise from a viewpoint on a hill opposite the volcano. 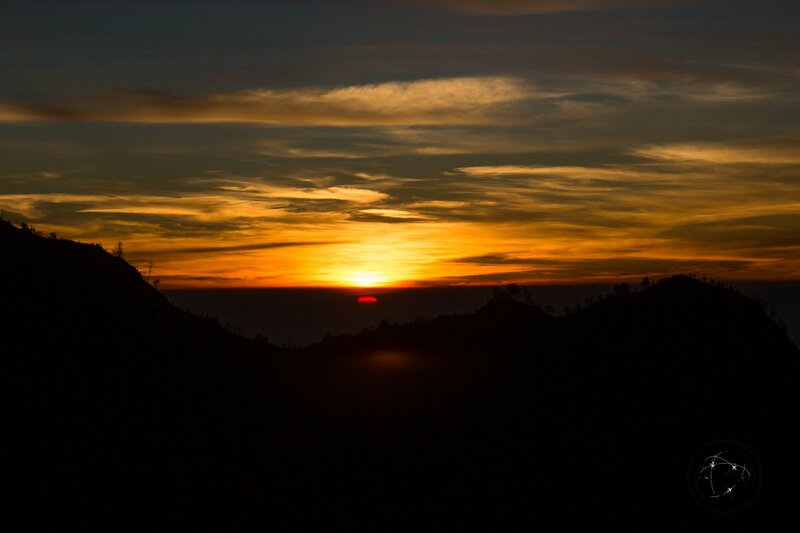 Contrary to popular misconception, the sun does not rise from behind the volcano, but on the opposite side (to the east, like any other sunrise in the world – the Mount Bromo sunrise is no exception!). It’s the way the volcano changes hues in the early morning light which makes the trip so worthwhile. There are actually three such view points (Penanjakan 1, Penanjakan 2 and King Kong Hill however there seems to be a lot of confusion about which is which). We were told that King Kong Hill was the least popular one so this is the point we decided to go to. This decision was shared by a “few” more people. The thousands of people at the top pushing each other for the best view makes me very much doubt that it is indeed the least popular. After waking up at 1.30 am, we managed to find King Kong hill viewpoint on our GPS (using Maps.me which seems to have all the viewpoints marked), and so took the route up. It quickly changed into a muddy trail with some steep steps and climbing involved. This is definitely not the same route taken by the jeeps and there seemed to be very few people climbing up this way, a lot less than were actually present at the viewpoint when we finally got there, so we assume that there’s some other way to access the viewpoint. We advise you to wear comfortable hiking shoes and get a few hours’ sleep before attempting to climb up the hill, it is not a walk in the park! We arrived to the viewpoint about 30 minutes before the first light made an appearance. 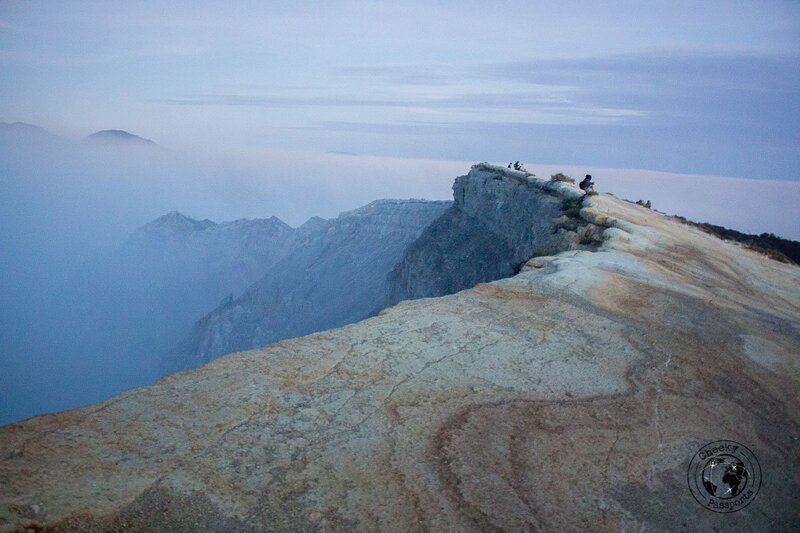 Take some cookies and food to munch on whilst waiting for the Mount Bromo sunrise spectacle to commence. 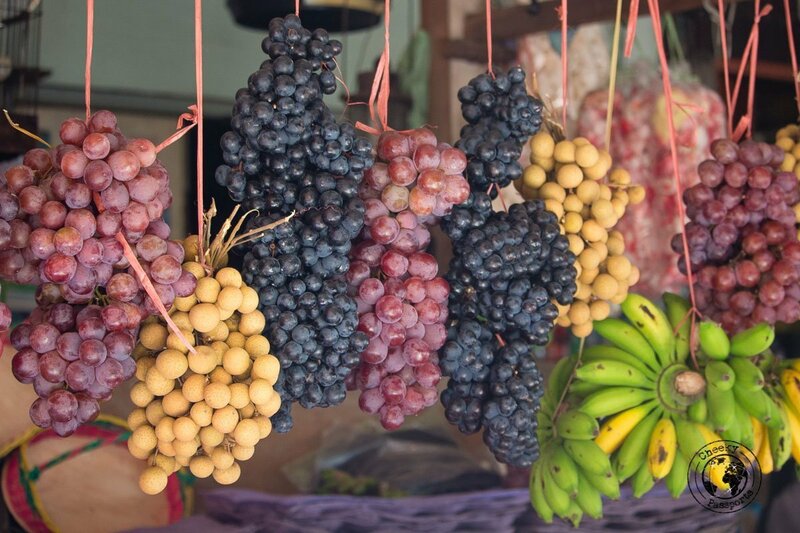 It is very cold up there and you will be glad of having something to help replenish your energy stores after the hike up. Of course, you can go to the viewpoint via tour or by a jeep, which can also be shared with some other travelers. Angkots will be waiting in Cemoro Lawang to take travelers back to Probolinggo after Mount Bromo sunrise viewing, so once you’re done with the viewpoint, you can walk back down the path (going downhill is way easier) and get some breakfast at one of the warungs lining the “main road” in Cemoro Lawang, before hopping on the angkot (35,000 IDR each for 15 persons) to Probolinggo. The angkot will stop you outside the bus terminal, from where you can either take a bus or a train to Banyuwangi. We decided that the train would be a far more comfortable option, and probably faster too! We got another angkot to take us to the train station (5,000 IDR each – €0.30) from where we bought tickets in business class (the only ones available for this particular journey) which set us back 120,000 IDR (about €7.50) each. Once we were in Banyuwangi we checked into our guesthouse, showered and proceeded to sleep for a few hours. 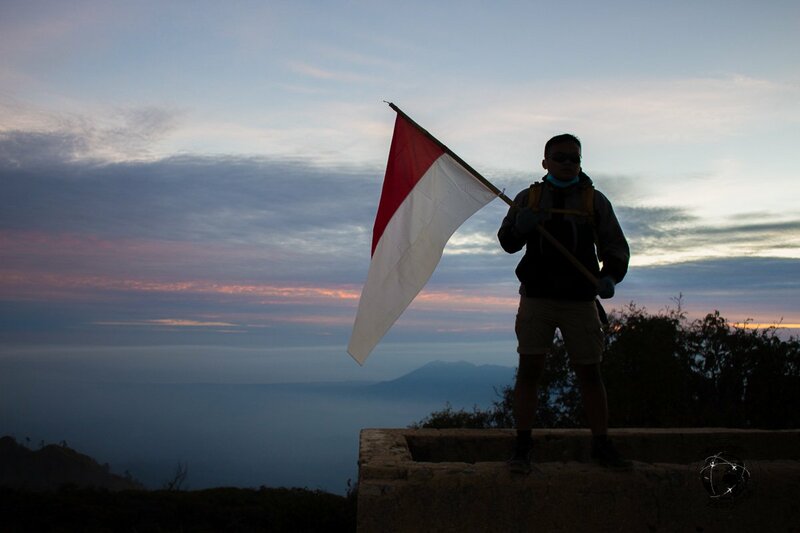 We would be picked up at midnight for hiking to the Kawah Ijen blue flames and crater and we were surviving on 3 hours sleep followed by a strenuous hike up to the viewpoint for the Mount Bromo sunrise, so needless to say, we were exhausted. Kawah Ijen is about an hour away from Banyuwangi so you’re going to need transport to get there. Together with our newly acquainted travel buddies, we managed to strike a deal with a driver (arranged through our guesthouse) for transport to and from Ijen to the guesthouse, a gas mask (it is very important to have a proper gas mask not just a dust mask) a flashlight for the Kawah Ijen hike and the entrance fee to Kawah Ijen, all for of 325,000 IDR (about € 20) per person. We thought that this was a fair price considering that the cost of the entrance fee ticket alone is 150,000 IDR (€9.30) and masks are normally rented for 50,000 IDR per person. Also included in the price was transport to the ferry terminal the next morning – the driver would return to the guesthouse one hour after having taken us back there after the climb (just to give us enough time for shower and breakfast), to take us to the ferry terminal from where we would take an onward ferry to Bali. You absolutely do not need a guide to hike up to Kawah Ijen blue flames or acidic crater. You can just follow the thousands of people hiking up at the same time. If you are lucky enough to not be part of a massive trail making its way up, then you could consider hiring one of the local miners as your guide. They will be more than happy to take you up for a small fee. There are two parts to the volcano hike. 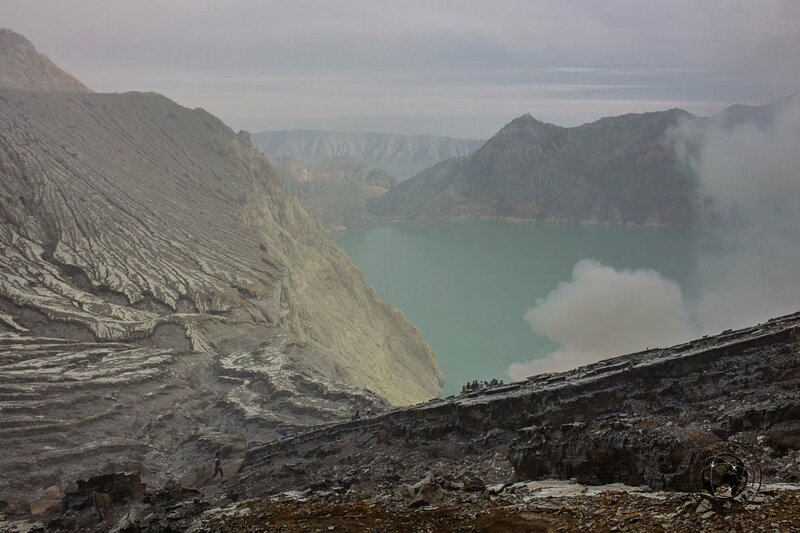 The first part is to see the Kawah Ijen blue flames inside the crater and second part is to hike right to the top of the crater from where you can (hopefully) see the turquoise lake in optimal conditions. Admittedly, we did not enjoy this experience much, mostly due to the (again I repeat) thousands of people going up at the same time. The first section of the volcano trail winds uphill and that’s fine, it is wide enough to take a good number of people. The path down to the Kawah Ijen blue flames on the other hand is a steep rugged, rocky, slippery, narrow ledge which is downright dangerous in most parts. We were lucky to be among the first 100 of people going down the path so we could watch our step and go down carefully. Going up the same path was a different story. People were pushing and shoving each other to go down, so much so that others were scared of going down and were blocking the path, whilst we were somehow trying to find a footing on the overcrowded path squeezing in between people. Again, I emphasise, the path is just a narrow slippery ledge. Lots of care is already needed when few people are using it, add the mad rush of a few thousands to the equation and you’re pretty much got a recipe for disaster. 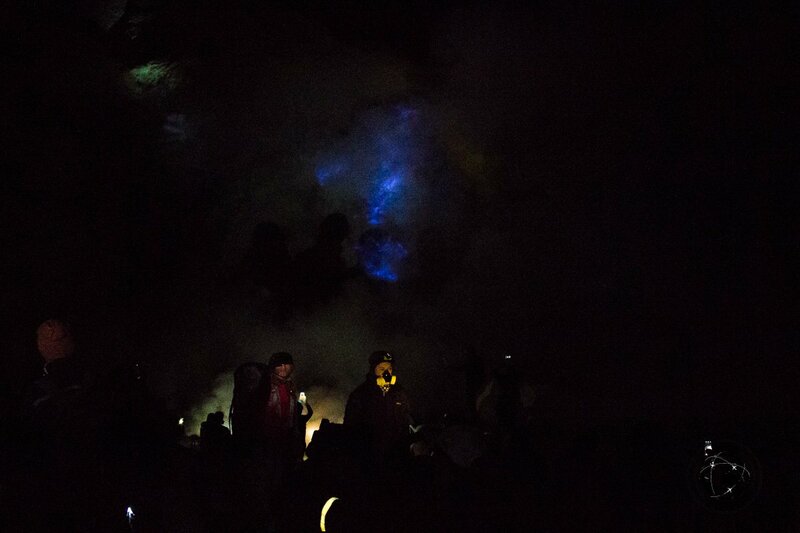 All this happens while the poor miners, who actually work there (there’s an active sulphur mine right at the Kawah Ijen blue flames viewing spot) are also trying to make their way up the steep dangerous path, each carrying about 90kg of sulphur on their backs. 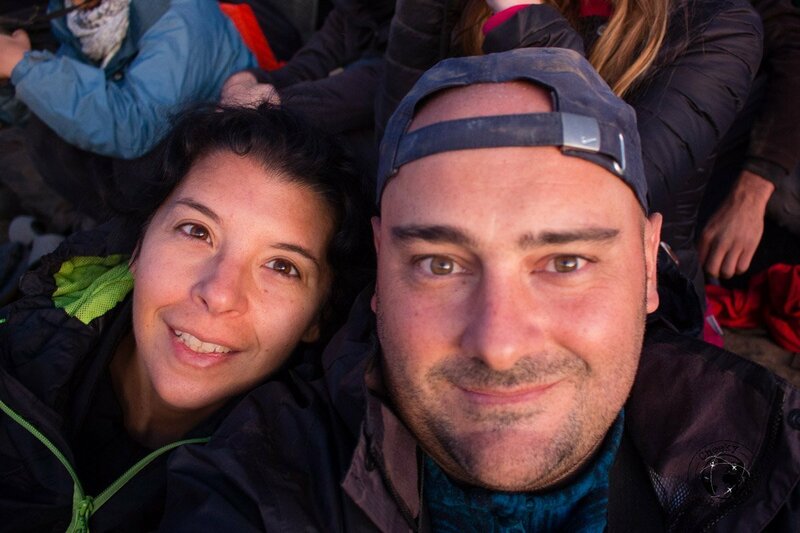 We thought that the whole experience was nothing short of ridiculous. Especially when you take into account the fact that many people were finding it difficult to breathe the sulphur-laden air (in part due to the poor quality gas masks), and that the miners, who must have already been suffering under the weight of 90kg of sulphur on their shoulders, were obviously finding their job even more difficult considering the sheer number of tourists they had to side-step every few seconds. 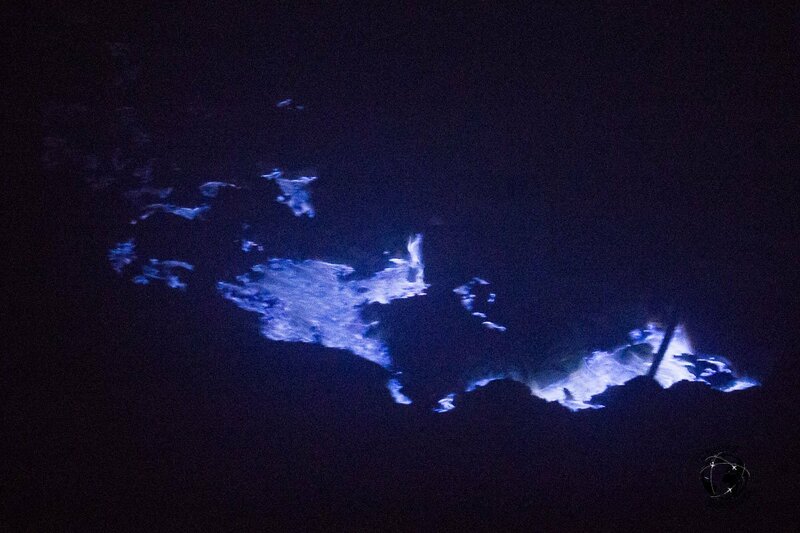 And the Kwaha Ijen blue flames? Not so impressive after all, we thought! We did buy a little sulphur souvenir from one of the miners for 20,000 IDR (€1.25). This was the asking price which we paid immediately as we didn’t have the heart to negotiate with the miner (as is customary in most parts in Indonesia). I would have bought lots more if only I could afford to carry them around for the next 10 months. I just cannot imagine the hardships of this job. 90kg of sulphur up the volcano several times a day – rain or shine. They don’t even use gas masks! After having hiked up and the down to the crater to view the Kawah Ijen blue flames, you can make your way to a path on the left going around the rim of the crater to an area where people gather round in groups to wait for sunrise. Important to note that the sun does not rise over the crater where the people gather, but right on the opposite side of it, so effectively you will not get to see the sun rise over the volcano from this spot. If you are lucky, what you will see is the turquoise-coloured acidic lake shimmering under the sun as it rises. ‘If you are lucky’ being the key phrase here… we were not. The lake was completely covered by the thick sulphur smog that particular morning, and breathing at the summit was becoming more and more difficult, so quite frankly we could not wait to go back down. 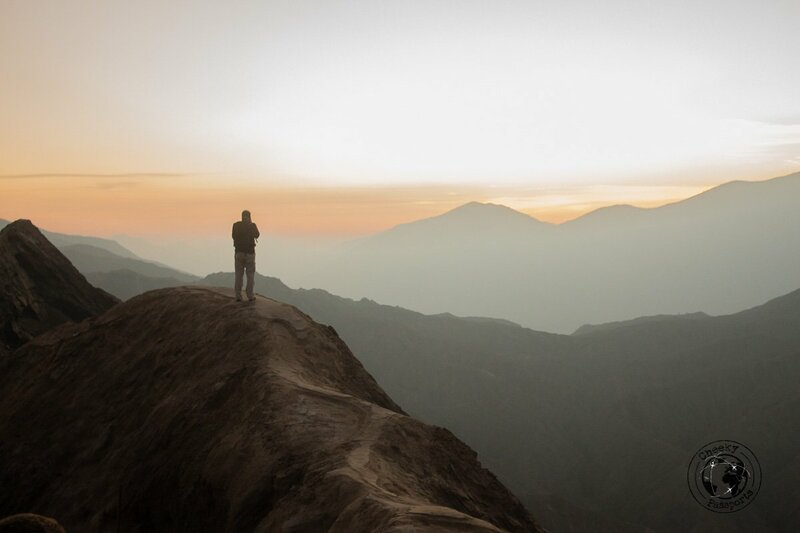 A very different experience to the Mount Bromo sunrise viewing! On the way down however, we did catch a 10-second glimpse of the lake which is, without a doubt, a beautiful spectacle. Those 10 seconds however were definitely not worth the lack of sleep, the hike up and down the paths, and the newly-acquired sulphur deposit in our lungs. We started off our trip from central Java, and the flow of this guide suggests such a route. Another popular route would be coming from Bali. A regular ferry crossing from Gilimanuk (Bali) to Banyuwangi is regularly available (every 30 minutes, 24 hours a day). No pre-booking is necessary, and the 40-minute sail costs a mere 7,500 IDR (€0.50). Once in Banyuwangi, the rest of the trip can be done in reverse. The most popular place to stay in Cemoro Lawang is Café Lava Hostel on the side of the main road leading to the crater, the only one that passes through the little village. We thought that the rooms were rather expensive so we preferred staying at Livia Homestay which, anyway was overpriced (as most accommodation in Cemoro Lawang tends to be). For 250 IDR,000 (about €15.50) we got a miniature room in which the bed just about fit, with a shared bathroom. Our room at Pepito’s Guesthouse was more than comfortable for an overnight stay and a great breakfast was served upon our return from Kawah Ijen. Highly recommended at just 117,000 IDR (about €7.26) for a good room with a private bathroom! All in all, it is indeed very possible to view the Mount Bromo sunrise and Kawah Ijen blue flames in 2 days without a tour. Is the hassle of moving from one area to the other so quickly worth your time, effort and money? 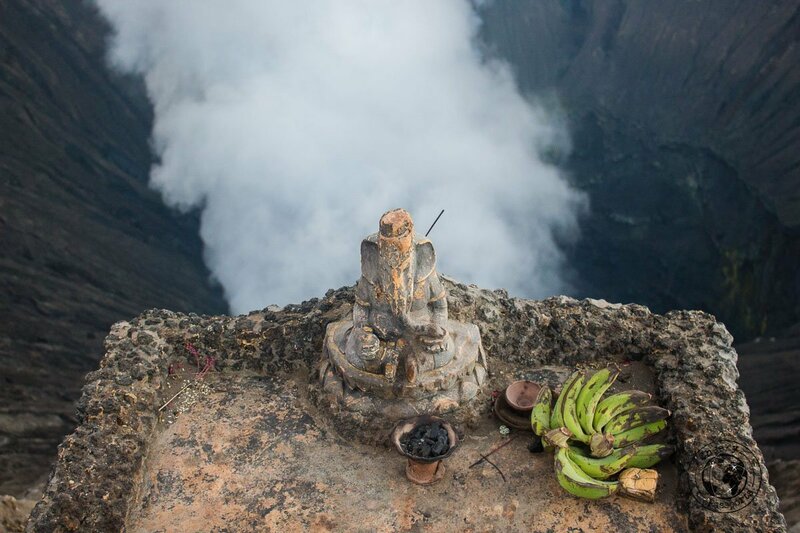 If you absolutely want to experience both volcanos and you are short of time, then yes. It would make a lot more sense though to give yourself more time at each site or to concentrate only on hiking one of the volcanos if you are short on time. 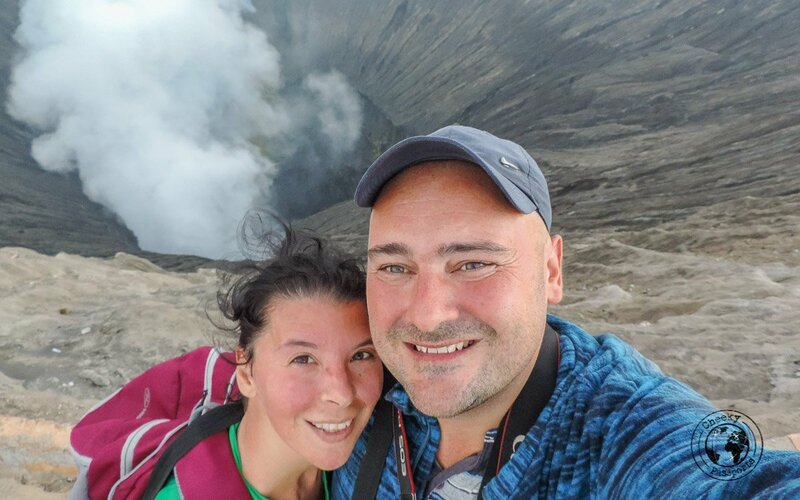 Our favourite would have to be Mount Bromo but we know lots of people who, unlike us, had a different experience and really enjoyed Kawah Ijen! Great article full of detail :). Thanks for the information provided. You guys are awesome!